Structure of Photinus pyralis firefly luciferase. Luciferase is a generic term for the class of oxidative enzymes that produce bioluminescence, and is usually distinguished from a photoprotein. The name was first used by Raphaël Dubois who invented the words luciferin and luciferase, for the substrate and enzyme, respectively. Both words are derived from the Latin word lucifer – meaning lightbringer. Luciferases are widely used in biotechnology, for microscopy and as reporter genes, for many of the same applications as fluorescent proteins. However, unlike fluorescent proteins, luciferases do not require an external light source, but do require addition of luciferin, the consumable substrate. A variety of organisms regulate their light production using different luciferases in a variety of light-emitting reactions. The majority of studied luciferases have been found in animals, including fireflies, and many marine animals such as copepods, jellyfish, and the sea pansy. However, luciferases have been studied in luminous fungi, like the Jack-O-Lantern mushroom, as well as examples in other kingdoms including luminous bacteria, and dinoflagellates. The luciferases of fireflies – of which there are over 2000 species – and of the other Elateroidea (click beetles and relatives in general) are diverse enough to be useful in molecular phylogeny. In fireflies, the oxygen required is supplied through a tube in the abdomen called the abdominal trachea. One well-studied luciferase is that of the Photinini firefly Photinus pyralis, which has an optimum pH of 7.8. Newer luciferases have recently been identified that, unlike other luciferases above, are naturally secreted molecules. One such example is the Metridia luciferase (MetLuc) that is derived from the marine copepod Metridia longa. The Metridia longa secreted luciferase gene encodes a 24 kDa protein containing an N-terminal secretory signal peptide of 17 amino acid residues. The sensitivity and high signal intensity of this luciferase molecule proves advantageous in many reporter studies. Some of the benefits of using a secreted reporter molecule like MetLuc is its no-lysis protocol that allows one to be able to conduct live cell assays and multiple assays on the same cell. Bacterial bioluminescence is seen in Photobacterium species, Vibrio fischeri, Vibrio haweyi, and Vibrio harveyi. Light emission in some bioluminescent bacteria utilizes 'antenna' such as 'lumazine protein' to accept the energy from the primary excited state on the luciferase, resulting in an excited lulnazine chromophore which emits light that is of a shorter wavelength (more blue), while in others use a yellow fluorescent protein (YFP) with FMN as the chromophore and emits light that is red-shifted relative to that from luciferase. 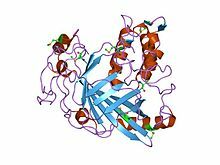 Dinoflagellate luciferase is a multi-domain protein, consisting of an N-terminal domain, and three catalytic domains, each of which preceded by a helical bundle domain. The structure of the dinoflagellate luciferase catalytic domain has been solved. The core part of the domain is a 10 stranded beta barrel that is structurally similar to lipocalins and FABP. The N-terminal domain is conserved between dinoflagellate luciferase and luciferin binding proteins (LBPs). It has been suggested that this region may mediate an interaction between LBP and luciferase or their association with the vacuolar membrane. The helical bundle domain has a three helix bundle structure that holds four important histidines that are thought to play a role in the pH regulation of the enzyme. There is a large pocket in the β-barrel of the dinoflagellate luciferase at pH 8 to accommodate the tetrapyrrole substrate but there is no opening to allow the substrate to enter. Therefore, a significant conformational change must occur to provide access and space for a ligand in the active site and the source for this change is through the four N-terminal histidine residues. At pH 8, it can be seen that the unprotonated histidine residues are involved in a network of hydrogen bonds at the interface of the helices in the bundle that block substrate access to the active site and disruption of this interaction by protonation (at pH 6.3) or by replacement of the histidine residues by alanine causes a large molecular motion of the bundle, separating the helices by 11Å and opening the catalytic site. Logically, the histidine residues cannot be replaced by alanine in nature but this experimental replacement further confirms that the larger histidine residues block the active site. Additionally, three Gly-Gly sequences, one in the N-terminal helix and two in the helix-loop-helix motif, could serve as hinges about which the chains rotate in order to further open the pathway to the catalytic site and enlarge the active site. A dinoflagellate luciferase is capable of emitting light due to its interaction with its substrate (luciferin) and the luciferin-binding protein (LBP) in the scintillon organelle found in dinoflagellates. The luciferase acts in accordance with luciferin and LBP in order to emit light but each component functions at a different pH. Luciferase and its domains are not active at pH 8 but they are extremely active at the optimum pH of 6.3 whereas LBP binds luciferin at pH 8 and releases it at pH 6.3. Consequently, luciferin is only released to react with an active luciferase when the scintillon is acidified to pH 6.3. Therefore, in order to lower the pH, voltage-gated channels in the scintillon membrane are opened to allow the entry of protons from a vacuole possessing an action potential produced from a mechanical stimulation. Hence, it can be seen that the action potential in the vacuolar membrane leads to acidification and this in turn allows the luciferin to be released to react with luciferase in the scintillon, producing a flash of blue light. All luciferases are classified as oxidoreductases (EC 1.13.12.-), meaning they act on single donors with incorporation of molecular oxygen. Because luciferases are from many diverse protein families that are unrelated, there is no unifying mechanism, as any mechanism depends on the luciferase and luciferin combination. However, all characterised luciferase-luciferin reactions to date have been shown to require molecular oxygen at some stage. In the reaction, a reduced flavin mononucleotide oxidizes a long-chain aliphatic aldehyde to an aliphatic carboxylic acid. The reaction forms an excited hydroxyflavin intermediate, which is dehydrated to the product FMN to emit blue-green light. Nearly all of the energy input into the reaction is transformed into light. The reaction is 80% to 90% efficient. As a comparison, the incandescent light bulb only converts about 10% of its energy into light. and a 150 lumen per Watt (lm/W) LED converts 20% of input energy to visible light. Luciferases can be produced in the lab through genetic engineering for a number of purposes. Luciferase genes can be synthesized and inserted into organisms or transfected into cells. Mice, silkworms, and potatoes are just a few of the organisms that have already been engineered to produce the protein. In the luciferase reaction, light is emitted when luciferase acts on the appropriate luciferin substrate. Photon emission can be detected by light sensitive apparatus such as a luminometer or modified optical microscopes. This allows observation of biological processes. Since light excitation is not needed for luciferase bioluminescence, there is minimal autofluorescence and therefore virtually background-free fluorescence. Therefore, as little as 0.02pg can still be accurately measured using a standard scintillation counter. In biological research, luciferase is commonly used as a reporter to assess the transcriptional activity in cells that are transfected with a genetic construct containing the luciferase gene under the control of a promoter of interest. Additionally proluminescent molecules that are converted to luciferin upon activity of a particular enzyme can be used to detect enzyme activity in coupled or two-step luciferase assays. Such substrates have been used to detect caspase activity and cytochrome P450 activity, among others. Luciferase can also be used to detect the level of cellular ATP in cell viability assays or for kinase activity assays. Luciferase can act as an ATP sensor protein through biotinylation. Biotinylation will immobilize luciferase on the cell-surface by binding to a streptavidin-biotin complex. This allows luciferase to detect the efflux of ATP from the cell and will effectively display the real-time release of ATP through bioluminescence. Luciferase can additionally be made more sensitive for ATP detection by increasing the luminescence intensity by changing certain amino acid residues in the sequence of the protein. Whole animal imaging (referred to as in vivo or, occasionally, ex vivo imaging) is a powerful technique for studying cell populations in live animals, such as mice. Different types of cells (e.g. bone marrow stem cells, T-cells) can be engineered to express a luciferase allowing their non-invasive visualization inside a live animal using a sensitive charge-couple device camera (CCD camera).This technique has been used to follow tumorigenesis and response of tumors to treatment in animal models. However, environmental factors and therapeutic interferences may cause some discrepancies between tumor burden and bioluminescence intensity in relation to changes in proliferative activity. The intensity of the signal measured by in vivo imaging may depend on various factors, such as D-luciferin absorption through the peritoneum, blood flow, cell membrane permeability, availability of co-factors, intracellular pH and transparency of overlying tissue, in addition to the amount of luciferase. Luciferase is a heat-sensitive protein that is used in studies on protein denaturation, testing the protective capacities of heat shock proteins. The opportunities for using luciferase continue to expand. ^ Huh S, Lee J, Jung E, Kim SC, Kang JI, Lee J, Kim YW, Sung YK, Kang HK, Park D (Jun 2009). "A cell-based system for screening hair growth-promoting agents". Archives of Dermatological Research. 301 (5): 381–85. doi:10.1007/s00403-009-0931-0. PMID 19277688. ^ Shimomura O (1985). "Bioluminescence in the sea: photoprotein systems". Symposia of the Society for Experimental Biology. 39: 351–72. PMID 2871634. ^ Baldwin TO, Christopher JA, Raushel FM, Sinclair JF, Ziegler MM, Fisher AJ, Rayment I (Dec 1995). "Structure of bacterial luciferase". Current Opinion in Structural Biology. 5 (6): 798–809. doi:10.1016/0959-440x(95)80014-x. PMID 8749369. ^ a b c d e f g h i Schultz LW, Liu L, Cegielski M, Hastings JW (Feb 2005). "Crystal structure of a pH-regulated luciferase catalyzing the bioluminescent oxidation of an open tetrapyrrole". Proceedings of the National Academy of Sciences of the United States of America. 102 (5): 1378–83. doi:10.1073/pnas.0409335102. PMC 547824  . PMID 15665092. ^ Okamoto OK, Liu L, Robertson DL, Hastings JW (Dec 2001). "Members of a dinoflagellate luciferase gene family differ in synonymous substitution rates". Biochemistry. 40 (51): 15862–68. doi:10.1021/bi011651q. PMID 11747464. ^ Fisher AJ, Thompson TB, Thoden JB, Baldwin TO, Rayment I (Sep 1996). "The 1.5-A resolution crystal structure of bacterial luciferase in low salt conditions". The Journal of Biological Chemistry. 271 (36): 21956–68. doi:10.1074/jbc.271.36.21956. PMID 8703001. ^ Elizabeth Wilson (Jan 18, 1999). "What's That Stuff?". Chemical and Engineering News. 77 (3): 65. doi:10.1021/cen-v077n003.p065. ^ a b Vanessa Knivett (2009). "Lighting the way". EE times. ^ General Electric TP-110, p. 23, table. ^ Contag CH, Bachmann MH (2002). "Advances in in vivo bioluminescence imaging of gene expression". Annual Review of Biomedical Engineering. 4: 235–60. doi:10.1146/annurev.bioeng.4.111901.093336. PMID 12117758. ^ a b "Introduction to Bioluminescence Assays". Promega Corporation. Retrieved 2009-03-07. ^ Williams TM, Burlein JE, Ogden S, Kricka LJ, Kant JA (Jan 1989). "Advantages of firefly luciferase as a reporter gene: application to the interleukin-2 gene promoter". Analytical Biochemistry. 176 (1): 28–32. doi:10.1016/0003-2697(89)90267-4. PMID 2785354. ^ Nguyen VT, Morange M, Bensaude O (Jun 1988). "Firefly luciferase luminescence assays using scintillation counters for quantitation in transfected mammalian cells". Analytical Biochemistry. 171 (2): 404–08. doi:10.1016/0003-2697(88)90505-2. PMID 3407940. ^ a b c Fan F, Wood KV (Feb 2007). "Bioluminescent assays for high-throughput screening". ASSAY and Drug Development Technologies. 5 (1): 127–36. doi:10.1089/adt.2006.053. PMID 17355205. ^ Meisenheimer PL, O'Brien MA, Cali JJ (September 2008). "Luminogenic enzyme substrates: The basis for a new paradigm in assay design" (PDF). Promega Notes. 100: 22–26. ^ Nakamura M, Mie M, Funabashi H, Yamamoto K, Ando J, Kobatake E (May 2006). "Cell-surface-localized ATP detection with immobilized firefly luciferase". Analytical Biochemistry. 352 (1): 61–67. doi:10.1016/j.ab.2006.02.019. PMID 16564487. ^ Fujii H, Noda K, Asami Y, Kuroda A, Sakata M, Tokida A (Jul 2007). "Increase in bioluminescence intensity of firefly luciferase using genetic modification". Analytical Biochemistry. 366 (2): 131–36. doi:10.1016/j.ab.2007.04.018. PMID 17540326. ^ Greer LF, Szalay AA (2002). "Imaging of light emission from the expression of luciferases in living cells and organisms: a review". Luminescence. 17 (1): 43–74. doi:10.1002/bio.676. PMID 11816060. ^ Lyons SK, Meuwissen R, Krimpenfort P, Berns A (Nov 2003). "The generation of a conditional reporter that enables bioluminescence imaging of Cre/loxP-dependent tumorigenesis in mice". Cancer Research. 63 (21): 7042–46. PMID 14612492. ^ Becher OJ, Holland EC (Apr 2006). "Genetically engineered models have advantages over xenografts for preclinical studies". Cancer Research. 66 (7): 3355–58, discussion 3358–59. doi:10.1158/0008-5472.CAN-05-3827. PMID 16585152. ^ Inoue Y, Tojo A, Sekine R, Soda Y, Kobayashi S, Nomura A, Izawa K, Kitamura T, Okubo T, Ohtomo K (May 2006). "In vitro validation of bioluminescent monitoring of disease progression and therapeutic response in leukaemia model animals". European Journal of Nuclear Medicine and Molecular Imaging. 33 (5): 557–65. doi:10.1007/s00259-005-0048-4. PMID 16501974. ^ Massoud TF, Paulmurugan R, De A, Ray P, Gambhir SS (Feb 2007). "Reporter gene imaging of protein-protein interactions in living subjects". Current Opinion in Biotechnology. 18 (1): 31–37. doi:10.1016/j.copbio.2007.01.007. PMC 4141564  . PMID 17254764. Trimmer B, Zayas R, Qazi S, Lewis S, Michel T, Dudzinski D, Aprille J, Lagace C (2001-06-28). "Firefly flashes and Nitric Oxide". Tufts University. Retrieved 2008-10-02. "Trends in development of reporter genes". reportergene.com. Retrieved 2009-03-07. "BL Web: Luciferin types". The Bioluminescence Web Page. University of California, Santa Barbara. Retrieved 2009-03-07. "Bioluminescence Reporters Protocols and Applications Guide". Protocols and applications. Promega Corporation. Retrieved 2009-03-07. "BL Web: Luciferin types". ISCID Encyclopedia of Science and Philosophy. ISCID. Retrieved 2010-04-20. David Goodsell. "Luciferase". Molecule of the Month. Protein Data Bank. Retrieved 2013-01-15. 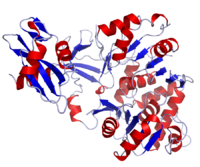 Bacterial luciferase is a flavin monooxygenase that catalyses the oxidation of long-chain aldehydes and releases energy in the form of visible light, and which uses flavin as a substrate rather than a cofactor [PUBMED:8703001]. Bacterial luciferase is an alpha/beta (LuxA/LuxB) heterodimer, where each individual subunit folds into a single TIM (beta/alpha)8-barrel domain. There are structural similarities between bacterial luciferase and nonfluorescent flavoproteins (LuxF, FP390), alkanesulphonate monooxygenase (SsuD), and coenzyme F420-dependent terahydromethanopterin reductase, which make up clearly related families with somewhat different folds [PUBMED:7776372, PUBMED:12445781, PUBMED:10891279]. For those sequences which have a structure in the Protein DataBank, we use the mapping between UniProt, PDB and Pfam coordinate systems from the PDBe group, to allow us to map Pfam domains onto UniProt sequences and three-dimensional protein structures. The table below shows the structures on which the Bac_luciferase domain has been found. There are 80 instances of this domain found in the PDB. Note that there may be multiple copies of the domain in a single PDB structure, since many structures contain multiple copies of the same protein sequence.